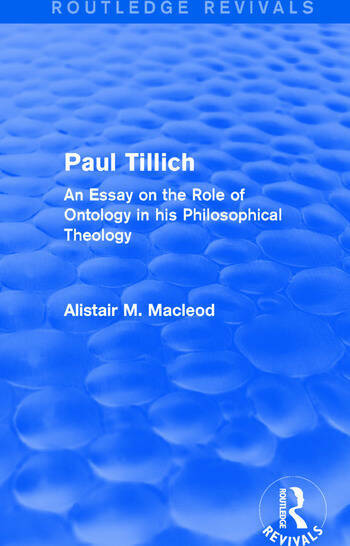 First published in 1973, this is the first book on Paul Tillich in which a sustained attempt is made to sort out and evaluate the questions to which Tillich addresses himself in the crucial philosophical parts of his theological system. It is argued that despite the apparent simplicity in his interest in the ‘question of being’, Tillich in fact conceives of the ontological enterprise in a number of radically different ways in different contexts. Much of the author's work is devoted to the careful separation of these strands in his philosophical thought and to an exploration and assessment of the assumptions associated with them. This book will be of interest to readers of Tillich and philosophers who specialise in ontology and linguistics. Alistair Macleod is Professor Emeritus at Department of Philosophy, Queen's University, Canada. He has been awarded Leave Fellowships by the Canada Council and the Social Sciences and Humanities Research Council of Canada, and he has also held a C.D. Howe Memorial Fellowship at the University of Oxford and a Research Fellowship at the Institute for Advanced Studies in the Humanities at the University of Edinburgh.